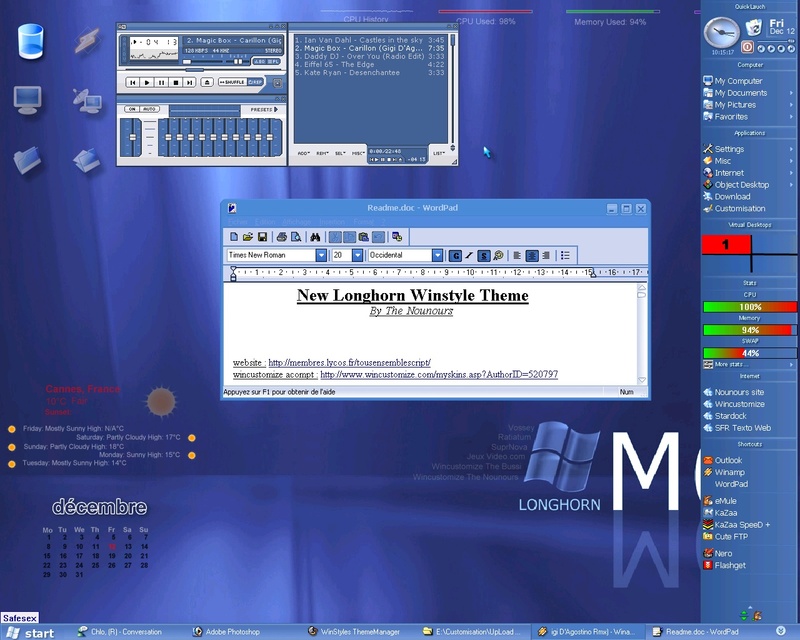 You must delete your New Longhorn.suite in your winstyle theme folder before download this one. Comments and credits are in the readme file. I hope you like it and pliz give me your comments ;). Thank you for rating the theme! Update v1.5 : Upgrate the objectbar. Change the wallpaper and the DesktopX theme. Thank your for rating the theme . If you have any problem with the objectbar plugins , donwload this packtage : http://membres.lycos.fr/tousensemblescript/SDPlugins.zip and extract it in your objectbar folder. Delete your New Longhorn folder into the Objectbar folder and download and install again the theme. I don't know why you can't save the theme :/ .. post a thread in the msgbord, perhaps somebody has an anwser. Very nice! I will certainly download this suite and check it out! The exception Floating-point invalid operation." HELP Please!!! :/ don't know why.. i'll pack it again in a few days and upload again the theme to correct this. Don't choise loading desktopX in the winstyle option while waiting . BTW I tried it on my PC at work as well and got the same issue, so repackaging it might be the right idea. why cant i open this damn thing!! Very nice longhorn skin. The bar at the right is great. somethime the sidebar its gives a error , futher thank you for this programm.